YAY! 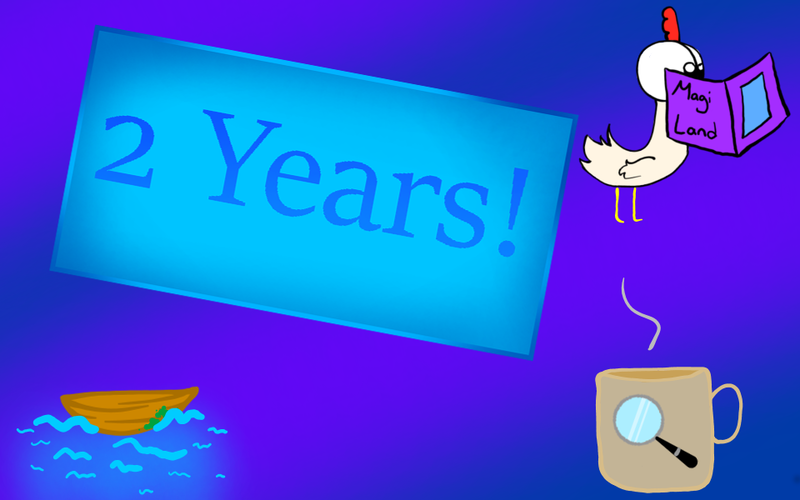 It's the blog's 2nd birthday on the 25th! Elmi smirked in an embarrassing way, still balancing her elbow on the motor. “‘Bread smackin?’ Isn’t that what Grey said?” The girls still felt bad for leaving so abruptly. But, they forced themselves to push regrets out of their mind. Bear was just too close now. Kaylin’s eyes widened as land rushed closer and closer. “ELMI!” she screamed. “I wasn’t joking! Stop!” All Elmi could do was swing around with terror as the rental boat went full speed towards the rocky shore. After being launched into the sand, Annabel was nearly impaled by a sharp, black rock, and the rest landed beside her in a pile of dry seaweed and itchy, white sand. They sat up in a slow, crooked fashion. “Thanks, Elmi, for really-” Kaylin couldn’t finish her sarcastic statement before Della muffled her mouth with a small hand. Kaylin spat it off, but stopped herself, this time, because she heard footsteps and knew they could only be from one source; the people in the black boat. The footsteps were hard to hear in the soft sand, so it was difficult to judge where the people were relative to the Cubs. They were hiding behind a spiny bush. In the day, they would be a plain sight behind the scraggly branches, but with it being so dark, they sunk right into the vegetation. If you were standing to the front of the bush, the girls would be invisible. “Sure are,” said the chill voice of a young man. Della lay calmly on the soft, mossy rocks. Wonderful nature sounds and the scent of leaves and water surrounded her. Her eyes drifted around the beautiful scene, and the blue-green water was still. She closed her eyes and heard soft footsteps coming near. “Della, time to go,” said a soft voice. So, she did, and took in the smooth air around her. She was in a sort of peace state, a quiet hum came from the back of her brain and she inhaled the wonders around her. She barely noticed the rhythm of her walking, or the blurry figure or her sisters leading her down the root-tangled path. The birds and tall trees were her only attention. A racing car sped by and snapped her mind back to focus. They were walking to town… to find a boat. Right. Then, they could go to Kenol, they could finally go home. Della wished that she really believed that it could happen. Weeks it had taken to get this far, days it had taken to get them into this mess. The feeling of home was just out of her fingers, just out of the way of grabbing it and bringing it close. The cool water had long dried off, and now the only wet the Cubs were feeling was sticky sweat. The summer heat cruelly poured down on the town. It made the Cubs’ search for a rental boat very downcast. Finally, after over two hours, they found one. It was by the same company as the last boat they rented: Charlie Waters. Elmi fiddled with the controls. “This ride’ll be a bit smoother than last time. At least I have some tricks to driving.” The last ride was a very bumpy ride. The speed varied in erratic intervals and Elmi seemed to be able to hit every harsh wave that was in their path. Annabel was feeling more than seasick. “Good,” Annabel said stiffly, and slowly lowered herself into the slow rocking boat. The young man behind the rental stand gave Elmi a curt little nod as she untied the rope. The boat started floating off and in no time they were speeding down the barrier to Kenol. The sleek, back speedboat was still following them at dusk. Annabel narrowed her eyes at it, looking at it with her head just peeking over the edge of the boat. Della was curled up in a ball and the air was becoming cold. “Land Ho!” Elmi yelled enthusiastically. Annabel gave her an annoyed glare. “We can’t get a boat ride until after 12:00! We have to stay on this pile of-” “That’s great!” Elmi interrupted. “Great?” Kaylin, Annabel, and Della screamed. How could staying away from Bear be great? “But-” Annabel started in a little outrage. “No, this island is known for its tourist attractions and great beaches,” Elmi reasoned. “There won’t be any black magic obsessives here… hopefully. Plus, someone gave me these.” She held up a ticket. Della giggled. “I can’t wait to see Bear, but I really want to relax a bit and we have to be out of this room by 10:00.” “I agree,” said Kaylin. The beach Green Stone was moderately crowded. It seemed the most popular beach, with signs and directions to it all over Middletown. Green Stone seemed a good name for the beach covered in mossy rocks. It was more like a gorge than a beach, with a big stretch of water surrounded by trees and rocky hills. The water was an unnerving green, but smooth and cool to the touch. “It’s 11:00, we should get going soon,” Annabel said with a sigh. “Really?” Della squeaked in excitement. Kaylin nodded and crossed her arms in an impressed way. Grass Cove was known all over Fuzz and Kenol. It was one of the most famous, most beautiful coves in all three of The Fishing Islands. Annabel’s eyes sparkled with the thought. “You got that with the ticket?” Annabel asked in wonder. Elmi smiled. “So, the map says there are two routes,” Annabel stared hard at the little map they got at registration. She lifted her glasses and her eyes followed the tiny directions. “What’s so bad about a little extra pool time?” Elmi laughed. Annabel gave her a look that said, I know what I’m doing, take it from me. Elmi gave her an eye-roll. “I’m with Elmi!” Della said. There was probably no opinion in that statement, but Della always trusted the oldest. Elmi smiled and ruffled her hair. “It does seem cool to have a mini-swim, but I’ve gotta trust the… the smartest.” Kaylin said with a little mischievous smile. Elmi’s mouth hung open for a few seconds. “I am taken aback!” Annabel and Della giggled at her while Kaylin stood proudly with her arms crossed. “We’ll try Elmi’s way first, and if that doesn’t work we’ll try my way,” Annabel said. Elmi tightened her lips, and agreed. The walk was short, well... it would be if Della hadn’t been reading the wrong path on the map. They got mixed up in the twisted trunks of the forest. Eventually, they found the right spot and they were sure of it. A length of river so far the eye could barely see the shore on the other side rushed in front of the four cubs. The raging water slapped rocks and fallen branches with painful force.